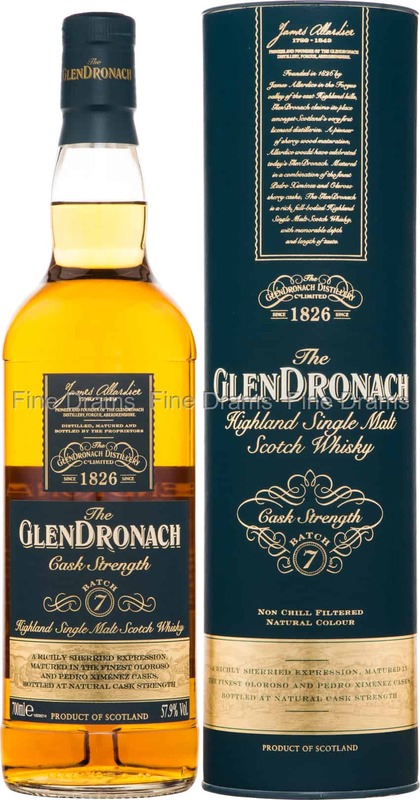 The seventh batch of Highland distillery Glendronach’s much adored cask strength series, which has had a slight redesign on the previous 6 editions. As ever with these Glendronachs, this is a whisky dominated by sherry cask influence, having been aged in a mixture of Pedro Ximénez and Oloroso casks. The result is a sherry cask whisky packed with typical Glendronach notes of prune, dried cherries, cranberries, woodspice, chocolate, coffee, ginger, blackcurrant, treacle, cream and caramelized apples. Bottled at a robust cask strength of 57.9%, this is an intense, fruity and rich whisky, perfect for the colder months. Another excellent bottling from this fantastic distillery.